1.250'' single spring, 100# @ seat, .560'' max. lift, 2.02 x 1.600 valves, 170cc intake runner. Included In Assembly: Erson stainless steel, ring and band valve seals, valve springs, Erson 7° retainers and keepers. Head Gaskets: Fel-Pro #1003 (265-350) or equivalent. An improved replacement for the factory Chevrolet 305-400ci cylinder head, World Products exclusive S/R Torquer series features 170cc intake runners and can provide up to a 30 HP increase over most OEM castings. Note, however, that these heads are accepted by many racing associations as ''stock'', and are 50-state emissions legal. S/R Torquer heads accept early and late model accessories. The valve seats are hardened to provide compatibility with unleaded gas. The S/R Torquer heads are available in 67cc and 76cc versions for engines up to 1986 and 76cc for 1987-later applications. They are designed to use 2.020'' intake and 1.600'' exhaust valves, and work well in engines from 302 to 400ci. 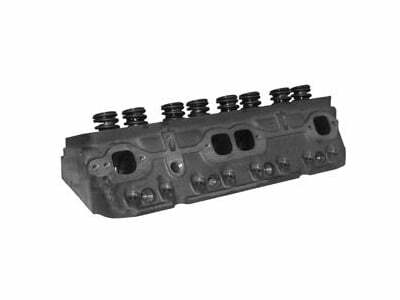 World's S/R Torquer 305 cylinder heads come with 58cc combustion chambers, and are ideally suited for use on 262-307ci small blocks.